Let’s pretend that swimsuits aren’t out yet at Target. Because then we don’t have to worry about eating this entire batch of bars. You know, there’s granola bars and then there’s like healthier granola bars. These are not that. The healthy ones, that is. 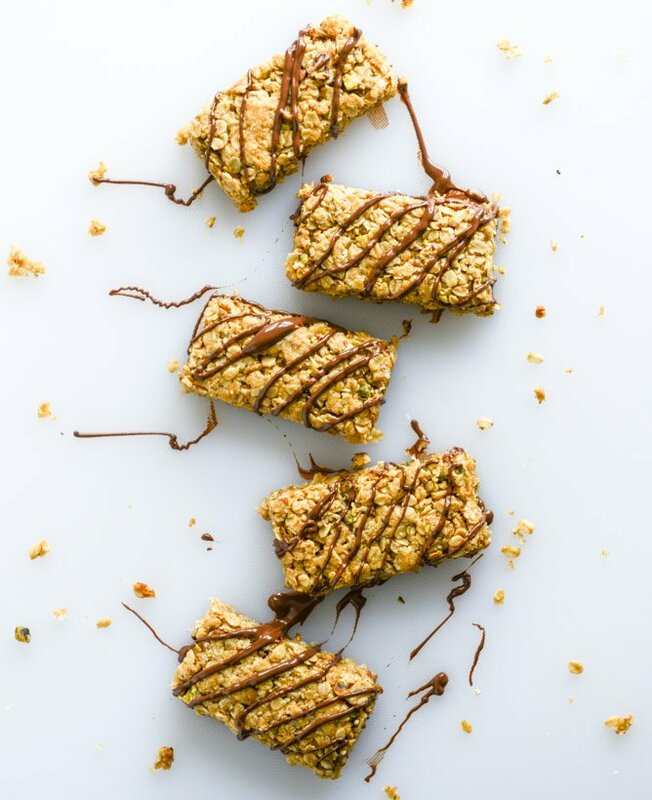 Think dessert granola bars. Isn’t that fun! But does it even really matter? Because while it’s been at least 15 years, I still want my stupid granola bars to taste like those delicious quaker chewy versions that could be found in abundance in school lunches circa 1999. Ugh. They are darn good. And isn’t there a s’mores version? And a million other wonderful flavors? That’s what I’m going for. 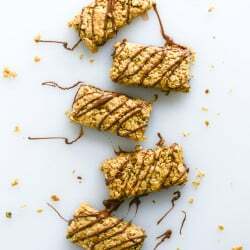 The worst part about homemade granola bars is that everyone wants a chewy granola bar and I think that everyone (because I can apparently speak for the universe) holds the texture of their current bar against that of the chewy version from their tweenhood. The bars that were so chewy, when you pulled them apart it was almost like marshmallow (or something else sticky, yeah) gooeyness. Why can’t those identical things be created in a kitchen? I know why. It begins with a P and ends in reservative. Life’s not fair. I do have a somewhat chewy good-for-you granola bar recipe in my cookbook. It’s delicious and chewy but also has nut butter, and for once in my life, I’m not feeling that at the moment. This recipe, on the other hand, is filled with wonderful things that promote the soft chewiness like butter and sugar and honey. And a chocolate drizzle because why not a chocolate drizzle. But. Then swimsuits are out at T to the arget and I want all parts of summer but that and probably shouldn’t have three bars for a snack. Even though there are so many cute ones that I like, OMG. Swimsuits, that is. Target and their mystical brainwashing and binge shopping air flow. Sneaks into the head. Speaking of OMGs, I’ve had the lyrics “she was like oh my god/this is my song/I’ve been listening to the radio all night long/sitting ‘round waitin’ for it to come on” in my head for over THREE days. That Luke Bryan knows what he’s doing. Or at least his songwriters do. Because if you’re like me, aka in the percentage of the stereotypical millennial general female population, those song lyrics are exactly how you speak and you actually think OMG, this is my song. So I figured I’d try to brainwash you with these granola bars, since we’ve already been brainwashed by chewy bars anyway. It no doubt is a continuation of my pistachio freak out obsession. Which makes me feel incredibly old, because I like to think that only old people like nuts. Or things with nuts. Or ice cream with nuts. I can say this because I am starting to like things with nuts. If you like things with nuts, I’m starting to get it. If you ever see me order a butter pecan ice cream cone though, please just drive me to the nearest assisted living community. It’s college for seniors, after all. I basically belong there already. Want to know something nuts, all puns intended? I took one of these bars for my breakfast on a plane last week and the person sitting next to me asked if I had another one. Either they had guts at 7AM or these just looked ridiculously good. I’m quite curious about this person that asked a stranger for a snack though. Preheat the oven to 325 degrees F. Spray a 9×13 inch dish with nonstick spray. In a large bowl, combine the oats, flour, pistachios, almond flour, coconut, brown sugar and baking soda. Stir well to mix. 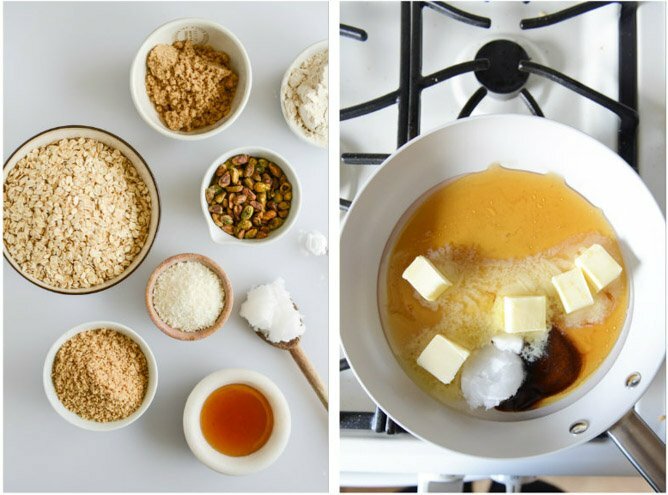 In a saucepan, combine the butter, coconut oil, honey and vanilla bean paste. Heat over low heat until the butter and oil melts, stirring the mixture together. Pour the butter mixture over the dry ingredients, stirring well until the entire thing is moistened. You don’t want any dry oat parts. Press the mixture in the greased dish and smooth the top with the back of a spoon. Bake for 18 minutes, or until the top is slightly golden and the bars are set. Allow to cool completely before slicing into bars. You can drizzle the chocolate on top before or after cutting – you can also dip them. Melt the chocolate chips in the microwave or a double boiler on the stovetop, stirring to fully melt the chocolate. Stir in the coconut oil and continue to mix until it’s melted. Drizzle the chocolate over top or dip the bars in the chocolate. These look so good! I also LOVED those chewy Quaker Oats bars…yum! I feel like Target bathing suits never disappear anymore. At least not in TN. 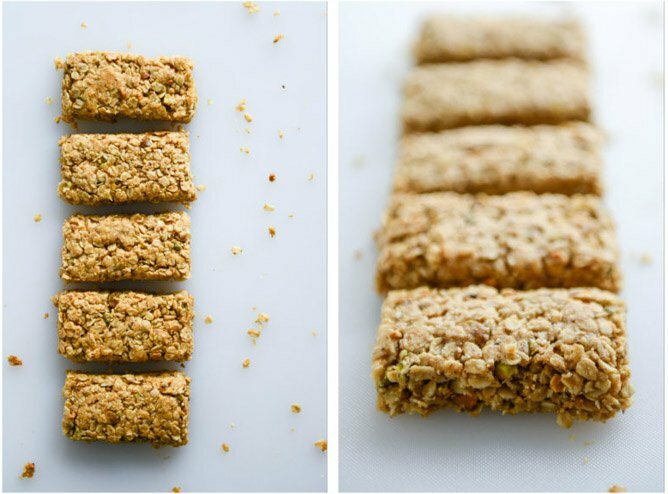 But regardless of the upcoming bathing suit season I need these granola bars. Love the pistachios in these! They look great! And these chewy granola bars. Yes, love those old school ones. But pistachio? God yes. i have been obsessed with that luke bryan song lately too!! These look crazy delicious — must give them a try since pistachio anything is my fave! I would not be able to stay away from these bars. Coconut, chocolate, pistachios. I love them all. Arg! These look fantastic. Thank you so much for sharing. 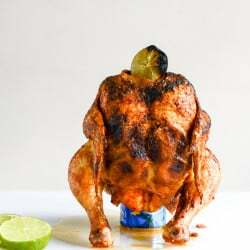 I’d like to make them this weekend. Did you use sweetened shredded coconut or unsweetened? These are so yummy! I made them last night, (with walnuts because I didn’t have pistachios), and they are almost gone already this evening! Oooh! These look so delish! I’m definitely in love with pistachios! Can’t wait to try it! Thanks for sharing this recipe! Is shredded coconut necessary or it can be substituted?